Last year, I created a blonde ale recipe intended to showcase Mandarina Bavaria hops and Orange Blossom Honey. To my surprise, the finished beer took second place (silver medal) at the 2017 Ohio State Fair's homebrewing competition. 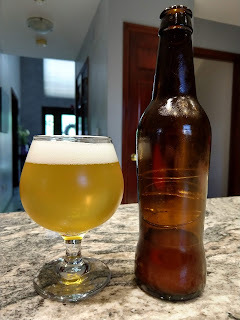 When I tried to re-brew that beer using the Picobrew Zymatic, despite their software claiming it would have a fairly low bitterness level, it actually came out so bitter that I entered it this year as a Pale Ale rather than a Blonde Ale. I decided to try again today, scaling the bitterness back to what I hope will match the original 1.0 brew, but using the Zymatic instead of The Grainfather. The mash process follows the Zymatic High-Efficiency mash profile, with times and temperatures altered slightly. The first mash step was set to 30 minutes at 152F. The second mash step was set to 156F for 35 minutes. A step was added to the boil to include the 10-minute orange peel, Irish Moss, and yeast nutrient additions. While Picobrew's recipe crafter reports that the finished beer should have 16 IBUs, the same recipe entered into BeerSmith predicts a 20.5 IBU value. The last brew showed 24 IBUs in the Picobrew recipe crafter, but tasted considerably more bitter than that. For that reason, I decided to go with hop addition amounts calculated by BeerSmith to see if the finished beer comes out at the right bitterness level this time around. Another change in this version is the swapping of Bitter Orange Peel (which I was out of) with Tangerine Peel (which I had on hand). I'm hopeful that will improve the orange flavor, but we'll see. Post-brewing, the wort is pumped to a kettle and the Orange Blossom Honey dissolved into it. Sterile steam-distilled water is added to achieve the volume and gravity targets. The wort is then chilled to yeast-pitching temperatures and transferred to a sanitized fermenter, where Clarity Ferm and US-05 yeast are added. The fermenter was then sealed and allowed to ferment at ambient temperatures without any temperature control. 05/26/2018: The Dough-In Process showed a little foaming, but not enough to cause a problem. The mash process showed little foaming, too, so I was able to comfortably leave the machine to finish the brew. Original gravity after the addition of the honey registered as 15.1 Brix on the refractometer. Volume registered approximately 2.3 gallons. After stirring in distilled water to get the volume up to 2.5 gallons, the gravity registered as 13.5 Brix, as expected. If the BeerSmith calculation is correct and the beer ends up at 20.5 IBUs (as opposed to the Picobrew crafter calculation that says 16 IBUs), this re-brew should come out very close to the original brew in The Grainfather last year. I had ordered and received a Tilt Hydrometer earlier in the week. It arrived on the day I brewed the beer. I unpacked it and calibrated it with a glass of water and good thermometer. After this beer was brewed, I sanitized the Tilt Hydrometer and dropped it into the wort before fermentation began. It registered 1.056 SG, the same original gravity I had estimated with the refractometer and BeerSmith earlier, which confirmed that it was reading correctly. 05/27/2018: I assembled a Raspberry Pi 3 B+ and loaded the Tilt Pi software onto it. The system began recording the gravity and temperature. The data is being logged to a Google Sheets spreadsheet. I'll capture that data and report it here when the fermentation is finished. I'm looking forward to using the Tilt to help determine when fermentation is complete and to identify in near-real-time when a fermentation is exceeding the intended temperature range. 05/28/2018: According to the Tilt Hydrometer, the gravity of the beer has dropped from 1.056 SG on Saturday night to 1.020 SG today. Wort temperature has been only gradually increasing, going from 69F at the start of fermentation to 71F now. Given the expected final gravity of 1.008 SG, it seems unlikely that the beer will exceed the yeast's ideal upper limit of 77F, so temperature control (as I suspected) appears to be unnecessary. Additional note: a small sample drawn from the spigot on the fermenter had a pleasing orange aroma and flavor. Unlike the previous batch, it appears to be well-balanced and not bitter. The tangerine note came through very clearly, too. I hope these qualities remain in the finished beer. 05/29/2018: The Tilt Hydrometer is now registering 1.012 SG as the beer's gravity and 67F as the temperature, essentially the same as the basement's ambient temperature. As noted above, PicoBrew's recipe crafter estimates that this beer will get down to 1.008 SG as a final gravity. Throughout the day today, the gravity has ranged from 1.013 to as low as 1.008 - though it has fluctuated often. (I'm not surprised by that. Any device attempting to turn an analog reading, like the degree of tilt, into a digital numeric reading like SG, is bound to fluctuate a bit due to variations in the wort surface, yeast activity, etc. I have little doubt that in a few days the readings will level out even more and settle in somewhere in the 1.008 SG vicinity. The current readings work out to 83.3% attenuation and 6.1% ABV. Airlock activity has slowed considerably at this point but is still visible. 05/30/2018: The gravity is holding fairly consistently around 1.010 SG and the temperature has held at 67F, the ambient basement temperature. I think it's safe to say fermentation is pretty well finished. 06/01/2018: The gravity has been very steady at 1.010 SG and 67F since May 30, so it's safe to say primary fermentation is over. Now it's time to do a gelatin finings treatment. 06/02/2018: As you can see in the graph below, the beer has held at a gravity of 1.010 SG for approximately 3 days, and the temperature has been a fairly consistent 67F or 68F. Given that fermentation is now complete, I'm ready to cold-crash and fine the beer using gelatin. I poured a half-cup of distilled water in a container and sprinkled a half-teaspoon of gelatin across the top of it. I allowed the gelatin to bloom for 20 minutes before heating the mixture to the 155F-158F range and adding it to the beer. I then moved the beer to my mini-fridge for chilling. I'll leave it there for a few days until it looks clear. 06/10/2018: The beer was bottled today, using four small carbonation tablets per bottle (medium carbonation). At the time it was bottled, the Tilt Hydrometer registered 38F as its temperature and 1.009 SG to 1.010 SG as its gravity. This means it reached 6.0% ABV and attenuation was 81.3%. 06/14/2018: Being the impatient sort when it comes to my beer, I've placed a bottle of this in the freezer to chill before doing a taste and carbonation test. The beer was extremely clear in the bottle, which gives me hope that it will pour clear later in the glass. (UPDATE) While the flavor is good and matches that of a natural orange, the beer was still almost totally flat at this point. It will take more time, and possibly some inversion of the bottles, to get the beer carbonated. 06/19/2018: The beer pours a very slightly hazy gold with thin white head. The flavor starts with a hoppy bitterness, followed by a brief hit of orange, then a mild maltiness. The finish is mildly bitter and lingering. It leaves behind a thin lacing in the glass. It's a bit more bitter than last year's version, but very easy to drink. 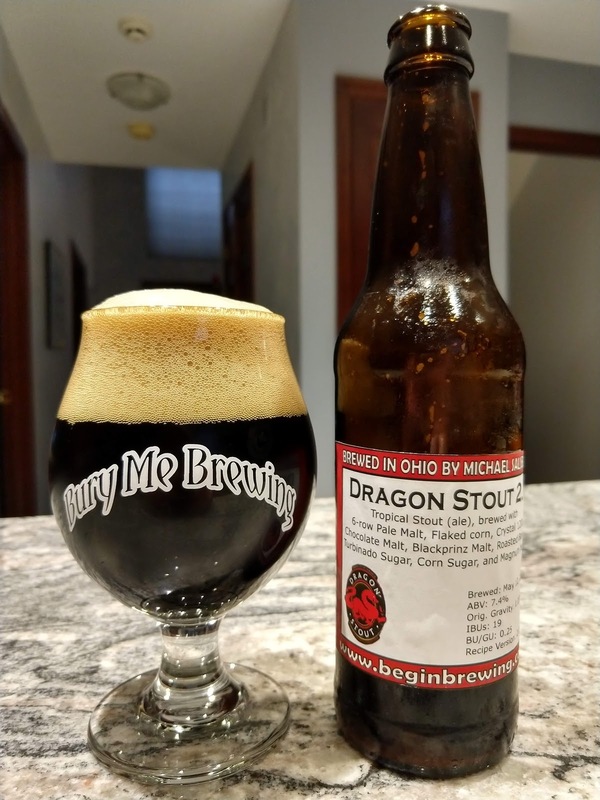 My first attempt at brewing a Dragon Stout clone resulted in a beer that initially tasted pretty good, but began to dry out and lose some of its subtle flavors and nearly all of its sweetness. When entered into competition, it scored extremely low. I might be upset about that if it wasn't for the fact that it was a published recipe, not something I'd come up with on my own. This version is no different. It's a recipe that did not originate from me, but looked like a closer match to the real beer than the previous one. Some readers may be wondering why I chose an ale yeast for this batch instead of the lager yeast I used last time. Although the BJCP says that the style is typically made with warm-fermented lager yeast, I decided that a relatively cool fermentation with ale yeast might achieve the same flavor profile. The ESB strain often produces some fruity notes (typically apple and/or tropical fruit) for which the Tropical Stout style is known. It may prove a poor choice in the end, but I wanted to try it out. The Zymatic High Efficiency Mash Schedule was used. The wort did foam out of the top of the step filter starting around the end of the Dough In step of the mash. During the first step of the mash, it foamed quite a bit more, but didn't seem to flow over the lid or into the drip tray. Foaming seemed to reduce during the second step of the mash, but never completely quit. This seems to be just "normal operation" for the Zymatic. After brewing, there was approximately 2.25 gallons of wort produced. Adding sterile distilled water to this dropped the gravity down to the expected 17.8 Brix and brought the volume back up to the planned 2.5 gallon amount. 05/12/2018: The chilled wort was poured into a sanitized fermenter into which the ESB yeast had already been added. No temperature control will be utilized in this case, as the beer is being kept in an environment with an ambient temperature in the mid-60's Fahrenheit, and the Lallemand ESB yeast is said to work optimally in the 68-72F temperature range. 05/21/2018: The beer was bottled with a Cooper's carbonation drop in each bottle and placed in my 76F "hot box" to carbonate. 06/02/2018: The beer is now out of the hot box and appears to be fully carbonated. Yield was 24 bottles. A bottle chilled and opened last night was good. I didn't take full tasting notes or a photo yet, but will do so in the near future. 06/14/2018: The beer pours a pitch black color with thin beige/tan head that lasts a little while before reincorporating into the beer. The aroma is chocolate with dark malt, and sweet. The flavor starts sweet and malty, becoming more roasty and chocolatey toward the middle, finish is malty and has a somewhat lactose or artificial sweetener note to it that I'm not crazy about. That might be something from the molasses in the turbinado sugar, or perhaps some combination of residual malt sugars combined with the ESB yeast flavors. Regardless, it's a nice beer but not one I'd enter into competition. I also don't view it as tasting that much like a real Jamaican Dragon Stout. I received my PicoBrew Zymatic back in December 2017, and made my first batches right away. It's now may 2018, and I've had about five months with it. If you're considering purchasing one, my experiences might help you make your decision. To date, I've made 22 batches with the Zymatic. That's about half of what I made all of last year. I've made a pale ale, two blonde ales, a malt liquor, a couple of Belgian Tripels, three Saisons, a couple of ESBs, three Belgian Dubbels, and some other styles. Some of these were my own recipes, while others were published somewhere. I would probably have brewed even more batches if I'd had the free time to do it. Only a few of the beers went into competition. They've gotten scores ranging from an average of 20.6 (a Tropical Stout from a published recipe) to 36.5 (a Kentucky Common, my own recipe). So if you're wondering whether the machine can produce good beer, the answer is yes - provided you give it a good recipe, ferment it properly, etc. If you choose a bad recipe, have poor brewing hygiene, etc., you'll get bad beer. The Zymatic won't make up for recipe issues or your own poor practices. If you're a fairly new brewer, I would encourage you to use some other brewing systems that require more manual effort during the mash and boil before moving to the Zymatic. It's important to have an understanding of how mashing, sparging, and boiling work before handing control over to the Zymatic - if you want to produce your best beer. The time I spent brewing on the kitchen stove, using the Grainfather, and cobbling together a sous vide based brewing setup were all helpful to me in understanding the brewing process. I had one batch (I forget which) where the Zymatic lost its WiFi connection briefly and decided to just stop running, rather than finish out the batch with the instructions it had. I find that a bit crazy, and would warn you that if you have "wonky" WiFi or Ethernet at your place not to leave the machine completely unattended, or you could come home to a machine full of soured grain and/or wasted ingredients. In the five months I've had the Zymatic, the two major plastic parts (the step filter/tray and the sample port) both failed in warranty and had to be replaced. The sample port cracked in the middle and began dripping wort during brewing. The step filter developed a crack near the hole between the grain chamber and the hop chamber, which caused it to leak wort under the tray during mashing. In both cases, PicoBrew support staff took excellent care of me and replaced the parts without hassle and at no charge. They also provided suggestions to ensure that I wasn't doing anything to cause those parts to fail. Both of the failed parts use clear acrylic plastic so you can see the liquid in them. It's important to note that acrylic plastic tends to be fairly brittle and prone to cracking or breaking, so you should always treat these parts as though they could be easily damaged (though they're not truly fragile, it's a good idea to treat them like they are). You should also never clean the Zymatic or its plastic parts with PBW (Powdered Brewer's Wash) as this will accelerate the deterioration of the plastic. Use PBW only in the metal keg and be sure to rinse it out thoroughly before reattaching it to the Zymatic. The online PicoBrew Recipe Crafter tool makes it fairly easy to "explain" to the Zymatic what you are brewing and how to brew it. It provides you with calculations of the expected volume, gravity, and bitterness of the beer. In all of the batches I've made, the Zymatic has only once generated the exact amount of wort the recipe crafter said it would. 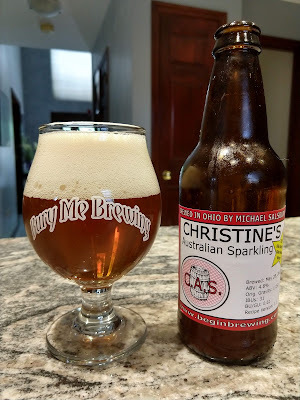 Typically, I will end up with anywhere from 1.8 to 2.3 gallons of wort at the end of the brewing process instead of the 2.5 gallons calculated by the recipe crafter. The calculated gravity is generally within 10 Standard Gravity points of the calculated value, though it's rarely right on target - probably because of the volume differences. Something that's kind of glossed over in the manuals is that you need to fully clean the keg after each brew. That means using a wrench or socket to remove the keg posts, soak the posts and tubes in PBW, scrub and/or rinse the posts and tubes until the PBW is gone, and then reassemble the keg. This is probably the most time-consuming part of cleanup with the Zymatic. Getting residue off the sides of the keg usually means a long soak in hot PBW solution and some "elbow grease" with a keg brush scrubbing the sides of the keg. This is followed by several rinses with hot water to ensure that the PBW is flushed out fully, so that it doesn't impact the step filter or sample port. My arms are too thick to reach very far inside the keg, so hand-scrubbing generally isn't an option. Cleaning the hop baskets is the next tricky bit. It's hard to get the hop particulate matter fully rinsed out of them. Even then, the baskets tend to pick up some discoloration from the wort and hops. I find that soaking them in hot water and Dawn dish detergent helps reduce the discoloration in the hop baskets and even in the step filter, but completely removing it seems impossible. Cleaning the step filter is the easy bit. Dump or scoop out the grain, remove the metal filter screens, the "hop loaf" (as it's referred to), and dump out the leftover wort. Rinse everything thoroughly in hot water and (after you finish your rinse and/or clean cycles for the machine itself), toss the step filter, screens, hop loaf, and hop baskets into your dishwasher with a Finish detergent tablet. Compared with the cleanup I've had in other brewing setups, it's much easier than most, and takes less time. This makes me more inclined to brew on days when my time may be limited. Overall, the Zymatic has been a great purchase. I'm able to brew more often. Brew days are less work. Cleanup is easier. The beer produced by the machine is as good as any I've made in other systems. It encourages me to experiment and re-do recipes. It's allowed me to focus on recipe formulation and leave the process to the machine. If I had it to do over again, I might buy the newer PicoBrew Z machines rather than the Zymatic, if only because that model is newer and can scale up modularly to larger batches. The Z Series model wasn't available until after I'd purchased the Zymatic, though, so I made the best purchase I could at the time. Apart from the foaming, gravity/volume issues, and some irritating quirks in the recipe crafter software, it's a very nice system and has made it easier to brew (and brew more often). It won't make up for any shortcomings in the rest of your skill set or process, but if you're a competent brewer already, it will help you produce good beer more easily.